I don't really eat too many grains any more - maybe a few oats from time to time, and some white rice. But Uncle Ben's said that they wanted to send me something new that was coming out, and they did. They sent me some packets of rice mixed in with other grains like quinoa. Now, I eat paleo pretty much all of the time, because I'm trying to keep my over-excitable immune system happy. But my family don't - they do eat healthily, don't get me wrong - but they can eat grains and the odd conventional treat, too. I also know that there are some of you that like your grains, and this seemed like quite a handy thing for you to know about. I mean, it microwaves in a couple of minutes. The packs come in different varieties - this one was '5 whole grains' and comes with wholegrain rice, red quinoa, millet, pearl barley and wild rice. It's pretty mildly-flavoured and I thought that it would be best off made into something else rather than just microwaved and tipped out of the pack onto the plate. So I stir-fried it with some lamb. I basically fried lamb mince in a dry pan until browned and then added a chopped red onion, a chopped garlic cloves and some finely chopped kale that I had at the bottom of the fridge. I tipped in the '5 whole grains' and stir-fried it all together and finished with a little swirl of avocado oil. They all gobbled it up and I wondered to myself if I could ever have otherwise been able to get my kids to eat these wholegrains. Probably not. The packs themselves, as the label proudly states, are free from artificial colours, flavourings and preservatives - but a quick read of the ingredients and they do contain soy sauce, red pepper, sunflower oil and spices to flavour it. Just in case any of you are watching those. 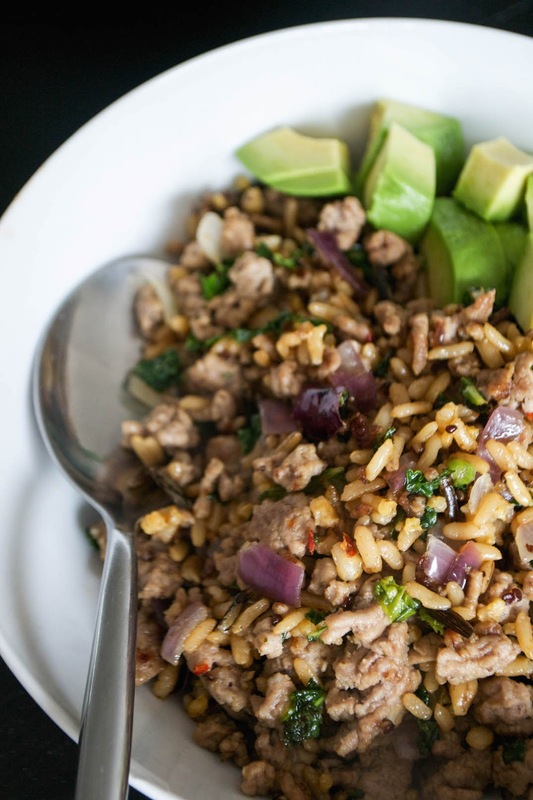 All in all, I think it's a handy way, if you eat grains, to have them in the kitchen ready for a quick stir-fry like this one. I used to love Gwyneth Paltrow's quinoa recipe with kale, spring onions and a fried egg on top and I can see it totally working with this, too. 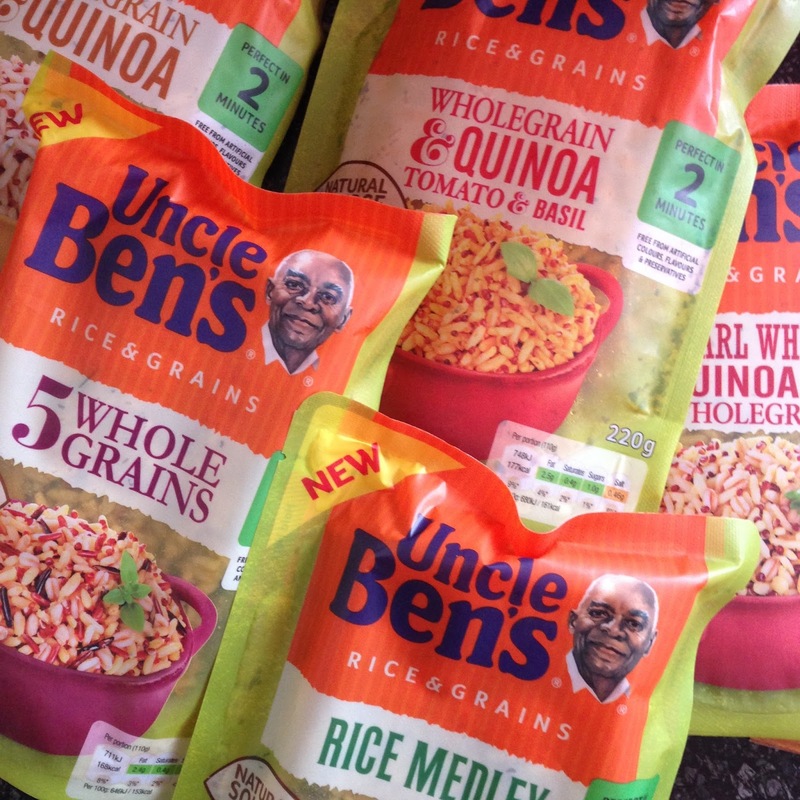 Find more information on 'rice and grains' at the Uncle Ben's website.